Chandigarh : “God’s ways are beyond comprehension. This month on 28th, we would have been celebrating Hardik’s birthday. And here, I am taking home the body of my beloved son. 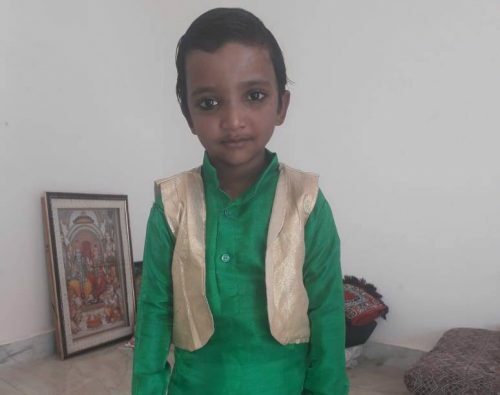 Who could have imagined that Hardik, our bundle of joy, would not be allowed to celebrate even his 5thbirthday,” stated Nitin Jain, the heart broken father of organ donor Hardik from Taraori, district Karnal, Haryana as he was being handed over the mortal remains of his demised son Hardik at the mortuary here at PGIMER today. The Jain family’s magnanimous gesture of consenting for Organ Donation gave a fresh lease of life to two terminally ill renal failure patients with transplantation of kidneys and the retrieved corneas would restore the sight of two corneal blind patients post transplantation. Recalling the heartache of April 1, donor Hardik’s father Nitin Jain narrated how quickly a generally happy day changed into an unexpected and cruel tragedy. Like any other usual day, Hardik was busy playing as he rolled over from the balcony of the second floor of his house and became unconscious. Immediately, an unconscious Hardik was first taken to a nearby private hospital in Karnal from where he was referred to PGIMER. Without losing any time, the family got critically ill Hardik admitted in PGIMER on the evening of 1st April itself. However, prognosis being extremely poor, Hardik’s ten days’ long struggle with life came to an end as he succumbed to his head injury and was declared brain dead yesterday night following the protocols of THOA. “As per regulations two confirmatory tests with a gap of 12 hours were conducted, after which we counselled the family about the possibility of organ donation. The family being aware about the concept deliberated amongst themselves, considered our option and eventually agreed.“ said Navdeep Bansal, Transplant Coordinator on duty at PGIMER. “It was a quite a tough call to say ‘yes’ to organ donation. But then we thought if someone had come to us at that moment and said there was an organ that could save Hardik, we would have jumped at the chance. So we thought of saving some one else the pain and agony of losing their child and went ahead with the decision. Its comforting to know that someone got a chance to live because of my dear son.” shared the brave heart father Nitin Jain.